WestSide High School hosted a very cool event called GirlPower last Wednesday that created an opportunity for groups of girls to work together to identify a community problem and try to solve it. I spoke with Sheena Zacherle, about the program. She’s the graduation specialist, a career and technical education teacher, leadership advisor and robotics coach at WestSide. Zacherle said the event was designed to encourage girls to consider STEM (science, technology, engineering and math) opportunities in school and as a career. A relatively low percentage of women can be found in those fields. GirlPower was organized through Central Washington GEAR UP, a federal program designed to encourage low-income kids to seek higher education. Hilary Martinez coordinated the event at the school and a group of community mentors was on hand to provide guidance and encouragement. The winning team members each received a Kindle Fire. 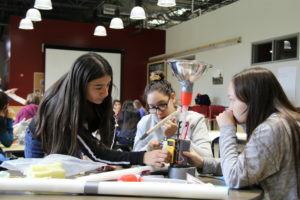 After the student groups identified a community problem, they took turns picking through a pile of computer parts and assorted other junk and then their teams worked to create a prototype solution to the problem. “The things that kids were created were amazing,” Zacherle told me. One team identified wildfire as an issue to be solved and then designed a water system to put fires out. The more opportunities that we can create in our schools to give students the chance to take risks, stretch their minds and apply their creativity to addressing problems relevant to their lives, the better. From left, WestSide students Ceclina Ramirez, Carolina Garibay, and Hannah Hofstrand work on their GirlPower project.